Are you passionate about sports? If your answer is yes, you do not necessarily need to be a sportsperson to make a career out of it. A career in sports management lets you build a career around sports. Sports management as a career has been thriving in the West for a long time and recently is picking up in India as well. A career in sports management could have various aspects. It could involve planning and organizing a sports event or an activity. Let us consider the Indian Premier League( IPL). It involves several matches played across various stadiums all over the country. Such a tournament needs to be planned properly and then managed efficiently. Such planning would involve managing resources, creating and sticking to a budget and executing the plan in a seamless and efficient manner. Sports management professionals have to work in tandem with broadcasters, advertisers and sponsors and also need to play a role in marketing the event. Similarly a sports management professional can also be involved in managing the activities of a team or a single player. When managing a team, a professional has to ensure that the team is profitable, the players are fit and events and schedules are planned in a proper manner. For an individual player, a sports manager can design and manage training programs suited to that particular player and also advise him on sponsors and endorsements. With sports getting more professional in India and the birth of professional leagues in different sports like cricket, football, tennis and so on, the demand for sports management professional is high. As we have seen, employment opportunities exist with teams, individual players and sports management and marketing firms. One can also be employed with the sports department of colleges, sports federations, companies selling sporting goods, sports channels or by stadiums and arenas that host sporting events. Another area where demand is growing is sports facilities for the general population which could include golf courses, tennis clubs and so on. Such facilities also hire professionals to manage them. You do not have to be a sportsperson to have a career in sports management. 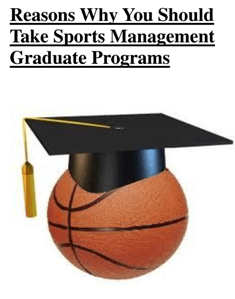 A person from any field can enter this career after completing a sports management degree. But former athletes and sports persons have often been successful sports management professionals. Those interested in this career after school can get a bachelors degree in physical education for a start. This has to be followed by a post graduate degree in sports management. Several institutes offer post graduate diploma courses and management degrees in sports management. The Alagappa University in Karaikudi, Tamil Nadu, Indira Gandhi Institute of Physical Education and Sports Science, New Delhi, Institute of Social Welfare and Business Management, Kolkata and University of Technology & Management (UTM), Shillong, are some of the institutes that offer a 1 year post graduate diploma in sports management. Two-year MBA courses are offered by the International Institute of Sports Management (IISM), Mumbai, and National Academy of Sports Management, Mumbai. A sports management degree is different from any other management degree in its focus area of study. One is taught different aspects of managing sports- sports law, sports marketing, media and press relations, sports finance, event management and sport ethics, among others. The scope for sports management was limited all these years with the focus mostly on cricket. With other sports getting attention, salaries for sports management professionals have gone up. Starting salaries an range between Rs 15,000- Rs 30,000 per month. With experience salaries grow and anyone with 4-5 years of experience can command a salary between 4 to 6 lakh per annum. A passion and liking for sports is obviously a must. Plus like any management field, one would need to handle pressure, work long hours, manage teams and communicate efficiently with others. If you want to merge your passion with your profession, this is the right career for you.